The activities of the Ministry of Foreign Affairs of Turkmenistan are regulated by the legislative acts of Turkmenistan: by laws “On Diplomatic Service,” “On the Status of Diplomatic Missions of Turkmenistan Abroad”, “On Diplomatic Ranks,” “On Consular Offices of Turkmenistan”, "On the State Protocol", "On the Ambassador Extraordinary and Plenipotentiary of Turkmenistan", "On international treaties of Turkmenistan", "On diplomatic representations of foreign states in Turkmenistan", Conception of the foreign policy course of Turkmenistan. The Ministry of Foreign Affairs of Turkmenistan consists of 21 structural subdivisions – 3 departments, 13 divisions and 5 representative offices of the Ministry in velayats (provinces). The tasks, functions and order of activities of structural subdivisions of the central office of the Ministry of Foreign Affairs of Turkmenistan are determined by the relevant provisions. 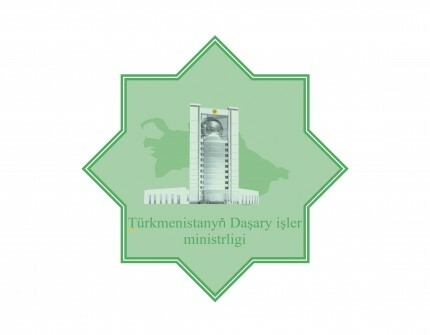 The structure and number of employees of the central office of the Ministry of Foreign Affairs of Turkmenistan, as well as of the diplomatic representations and consular offices of Turkmenistan abroad, are approved by the President of Turkmenistan. In accordance with the law “On Diplomatic Service of Turkmenistan” – “Diplomatic service is a type of state service associated with the execution of powers to implement the foreign policy of Turkmenistan, representation and protection of rights and legitimate interests of Turkmenistan in international relations. The legal basis of the diplomatic service is the Constitution of Turkmenistan, the Law on the Diplomatic Service of Turkmenistan, other normative legal acts of Turkmenistan, international treaties of Turkmenistan, as well as generally recognized principles and norms of international law. The system of diplomatic service includes the Ministry of Foreign Affairs of Turkmenistan, diplomatic representations and consular offices of Turkmenistan abroad, missions of Turkmenistan to international organizations, representative offices of the Ministry of Foreign Affairs of Turkmenistan in the territory of Turkmenistan, also institutions, and organizations, educational institutions created to ensure the implementation of the foreign policy course of Turkmenistan. The Ministry of Foreign Affairs of Turkmenistan is a central executive body that implements foreign policy activities and regulates the system of diplomatic service of Turkmenistan. The organization of activities of bodies and institutions that are part of the diplomatic service system is carried out by the Ministry of Foreign Affairs of Turkmenistan”. At present, Turkmenistan has established diplomatic relations with 146 states of the world. There are 38 diplomatic missions and consular offices of Turkmenistan abroad. The diplomatic representations of 35 foreign countries and 15 representations of international organizations work in Turkmenistan. Turkmenistan is a party to 145 international conventions and treaties. The priorities of Turkmenistan’s foreign policy are to maximize the promotion of comprehensive peace, stability and security, consistent implementation of the UN Sustainable Development Goals, consolidation of neighborly relations and cooperation in the region and beyond, creation of favorable conditions for the implementation of disarmament, settlement of the existing conflicts and contradictions by peaceful political means, and ensuring energy security. Turkmenistan consistently consolidates traditionally friendly and mutually beneficial relations with neighboring States, especially with the Central Asian and Caspian Basin countries. At the same time, close cooperation with the States of the Middle and Near East, Asia and Pacific Ocean region is developing. The main course of the foreign policy of Turkmenistan is multilateral partnership with the countries of the European and American continents. In recent years, on the instructions of the National Leader, work has been undertaken to expand fruitful dialogue with the African countries. The relevant measures are undertaken on further development of cooperation with the authoritative international organizations and structures. Turkmenistan is a member of 46 international organizations, such as the United Nations Organization, Organization for Security and Cooperation in Europe, Organization of Islamic Cooperation, Non-Alignment Movement and etc. In such organizations as the Commonwealth of Independent States and the Economic Cooperation Organization, Turkmenistan has a status of an associated member. The country is a member of 9 Councils, Committees and Commissions of the UN. Turkmenistan participates actively in the global processes of development and implementation of Millennium goals and objectives. As one of the main components of its foreign policy, Turkmenistan considers its active involvement in the work of the UN, aimed at ensuring human progress and development, increasing living standards and well-being of the people, creating favorable conditions for the global economic and social development, maximum realization of the creative capacities of an individual and promotion of the human rights and fundamental freedoms. Within a short period of time, the UN General Assembly adopted Resolutions on the role of Turkmenistan's neutral policy, energy security, the role of transport and transit corridors, which is a clear example of our country's fruitful cooperation with this organization for peace and sustainable development at the global level . To this end, initiatives have been put forward by the President of Turkmenistan in various international forums, in particular the proposal on establishment of the Energy Council of the UN, establishment of a high-level permanent forum on security and cooperation in Central Asia and in the Caspian Basin, five points of promoting the political settlement in Afghanistan and its economic reconstruction, and a range of other important initiatives. It is important to note that, at the initiative of Turkmenistan, at the 82nd meeting of the 72nd session of the United Nations General Assembly, two Resolutions were adopted: "Cooperation between the United Nations and the International Fund for Saving the Aral Sea" and "World Bicycle Day", which was first celebrated on June 3, 2018 . This is a clear recognition by the international community of the relevance and importance of the initiatives of our country; another success of Turkmenistan's foreign policy aimed at ensuring the safe life of mankind, protecting the environment and promoting sport at the international level. Active participation in the implementation of the Sustainable Development Goals is one of the key areas of Turkmenistan’s activity within the framework of the United Nations. As is known, during the 39th session of the General Conference of UNESCO, Turkmenistan was elected to the Intergovernmental Committee for Physical Education and Sport (CIGEPS) for 2018-2021. Priority in this direction for Turkmenistan is the holding in the country under the auspices of UNESCO of the 7th International Conference of Ministers Responsible for Physical development and Sports (MINEPS-7) in 2021. At the 74th plenary meeting of the United Nations General Assembly held on December 20, 2017, the following Resolution was adopted, initiated by Turkmenistan "Strengthening the links between all modes of transport in order to achieve sustainable development goals". On February 22, 2018, by the decision of the 80th meeting, Turkmenistan was elected a member of the Bureau of the Inland Transport Committee of the United Nations Economic Commission for Europe (UNECE) for the period 2019-2020. Taking into account Turkmenistan’s presidency in the International Fund for Saving the Aral Sea (IFAS) it is planned to organize in Turkmenistan in 2018 the summit of the founding states of the IFAS with the participation of specialized international entities, such as the United Nations Development Programme (UNDP), United Nations Environment Programme (UNEP) and the UN Regional Center for preventive diplomacy for Central Asia. Work is underway to nominate Turkmenistan for ECOSOC for the period 2019-2021. On April 18-20, 2018, the 17th meeting of the Transport Sector Coordinating Committee (TSCC) of the Central Asian Regional Economic Cooperation (CAREC), which was chaired by Turkmenistan as the chair of the CAREC program in 2018, was held in Istanbul, Turkey. to the Executive Board of the United Nations Entity for Gender Equality and the Empowerment of Women (UN-Women) for the period of 2016-2018. In 2016 Turkmenistan was unanimously elected to the following structures of the UN: the United Nations’ Commission on Science and Technology for Development for the period of 2017-2020, the United Nations Commission on Population and Development for the period of 2016-2020, and the United Nations Social Development Commission for the period of 2017-2021. Collaboration with authoritative organizations is pursued in a systemic manner, as demonstrated by the Partnership Framework for Development between Turkmenistan and the UN for the period of 2016-2020, Action Plans of Country Programmes on Cooperation with the UNICEF and the UNFPA for the period of 2016-2020 and a number of other documents signed in 2016. All of them are aimed at the realization of concrete joint projects on socio-economic, energy, environmental, legal and other areas. As is known, Turkmenistan has been repeatedly a venue for major international forums, the agenda of which included the pertinent issues of the present. In 2016 Ashgabat hosted the first Global Conference on Sustainable Transport that convincingly demonstrates the increasing authority of Turkmenistan on the world stage.